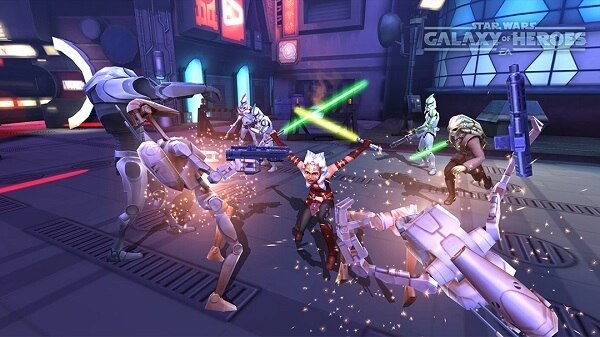 Star Wars Galaxy of Heroes is a free mobile game available on Android and iOS. If you’re a Star Wars geek, exactly like me, then you know very well the feeling of emptiness that came with the realization that we have to wait another two years for episode eight. 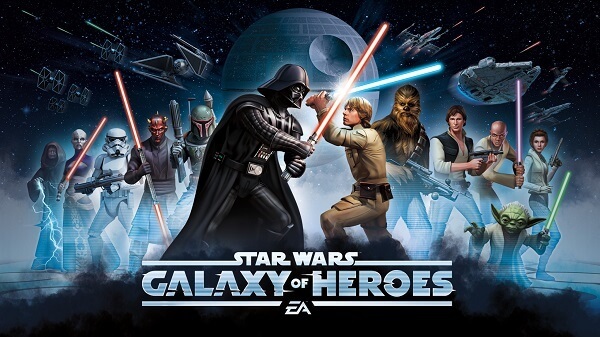 We have to get our daily dose of Star Wars, and Galaxy of Heroes is the perfect drug! 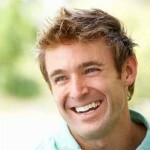 It has in-app purchases, and like any other freemium, those who pay have the upper hand. 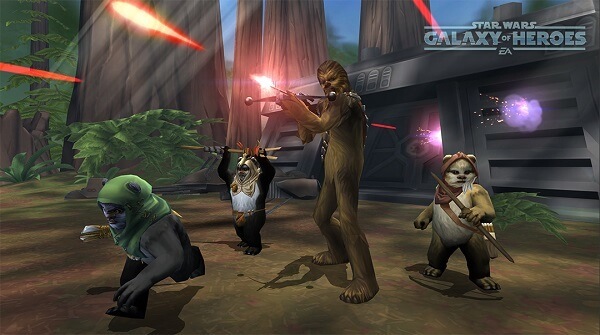 That’s where we come in – you don’t have to pay a dime to have fun and win battles in Star Wars Galaxy of Heroes. 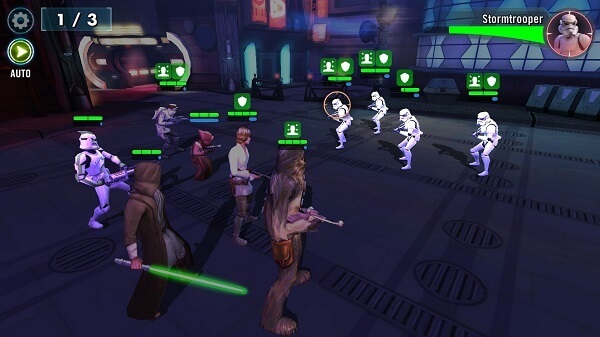 You can download Star Wars Galaxy of Heroes for Android and iOS right now! 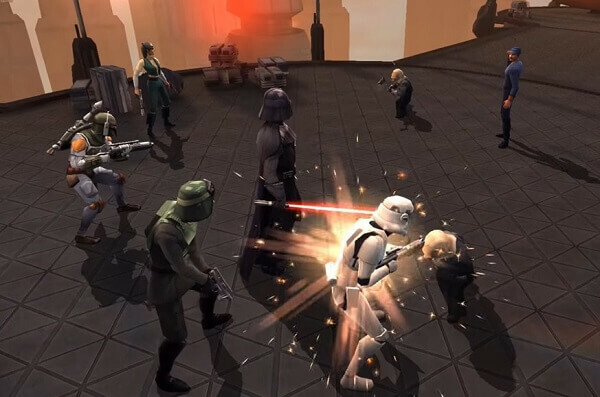 At the beginning of the game, you’ll have a a party member that can attack more than one enemy – in geeky gaming terms, it’s called a splash attack, or an AOE attack, which means area of effect. During your Dark/Light battles, you’ll find that to get to the final boss battle you’ll have to destroy a series of enemies. The final squadron is tough as nails, and it’s wise to save all of your best attacks for last. Don’t waste any energy or power-ups before the last skirmish. 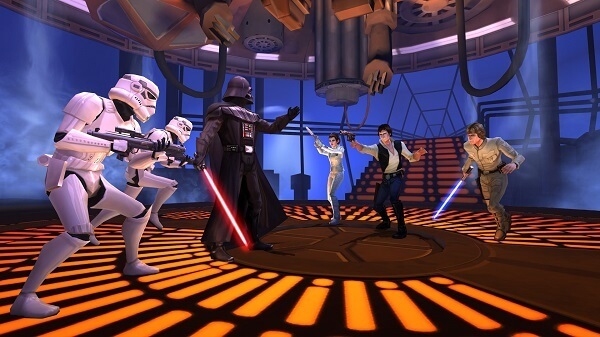 You’ll want to gather as much credits, XP, energy and crystals as you possibly can. In order to do so, you have to complete certain Daily Activities and Achievements. 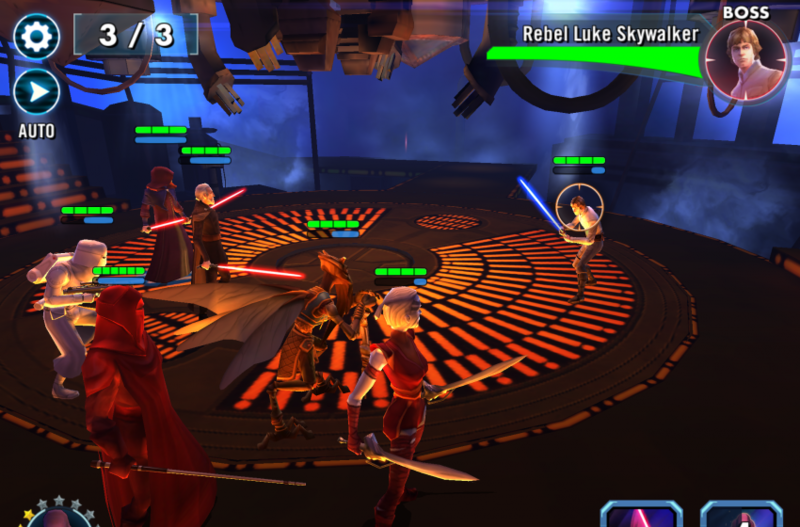 Activities usually task the player with training several specific characters, completing a particular number of Dark/Light fights, finishing a number of battles and so on and so forth. Completing them on a daily basis will be fruitful on the long run, as you’ll amass a lot of rewards day by day. Don’t forget to check your Achievements and see what you can do to gain more goodies. Some can be completed in a matter of minutes, while others can be marked as done after a few weeks of gaming. The Blue Meter is located just underneath a character’s green HP bar. Once filled up, that character can attack. It’s of the utmost importance as it tells the player when an enemy is ready to jump in. It’s best that you aim all of your attacks on the foe that is about to fill its Blue Meter so there’s absolutely no chance of a gruesome assault. Pay attention to your party members to see who’s up next, and how you can retaliate. At the beginning of a battle, try to destroy the strongest foe who already has its Blue Meter completely filled up. If you want to partake in Challenge Mode battles, be warned that you’ll encounter much powerful enemies. Some bosses can even wipe your entire party without you even landing a blow. For this kind of fights, you’ll need to equip your squadron with characters that can lower your enemy’s offensive capabilities. They are usually called debuffs. Furthermore, you should carry at least one Healer – I prefer two, but one can do its job quite nicely. If you do all of this, then you’ll have a chance at being top dog in Challenge Mode. There’s no need to scour the internet for locations and battles in order to get Chewbacca the massively powerful Mk 1 BlasTech Weapon Mod. Just check your character, tap on one of the inventory slots and press the Find option. The game will point you towards what Dark or Light battle you need to beat to gain that item. 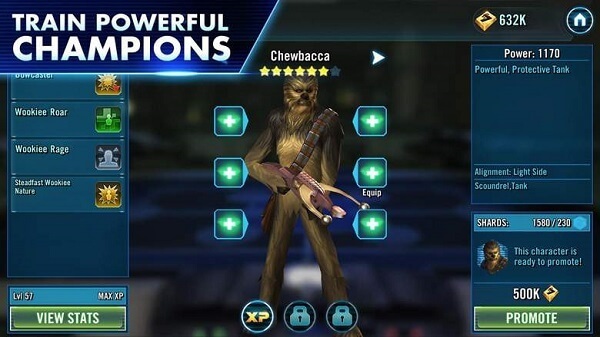 You can do this for each and every party member, not just for Chewie. Why yes, I will very much like to add Darth Vader to my squadron. But how? You’ll need 80 Shards to add this almighty villain to your party. In order to do so, you’ll have to complete every main achievement the game has to offer. No, they’re not going to back stab you like Anakin did with Obi Wan Kenobi. It’s just that you don’t want to waste resources on characters that you’ll never use. Don’t have favourites, that is, if you intend to win. Characters with weaker stats should always be replaced by better new ones as soon as possible. Play the game as much as possible and rank up a ton of heroes. 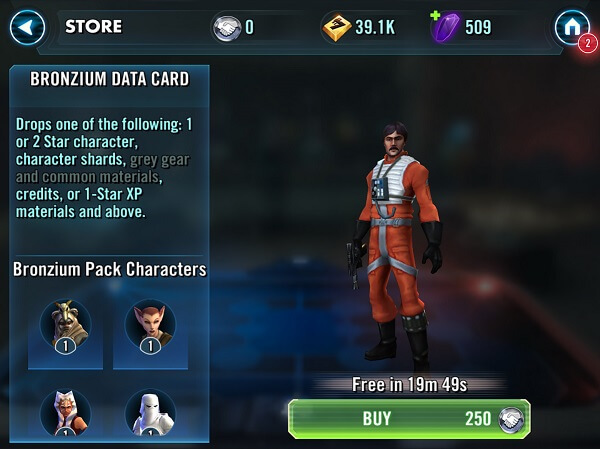 Complete special events, amass Shards, and pick up your free Bronzium Data Cards. Complete every dark/light battles on every difficulty possible to grow your party! 2. 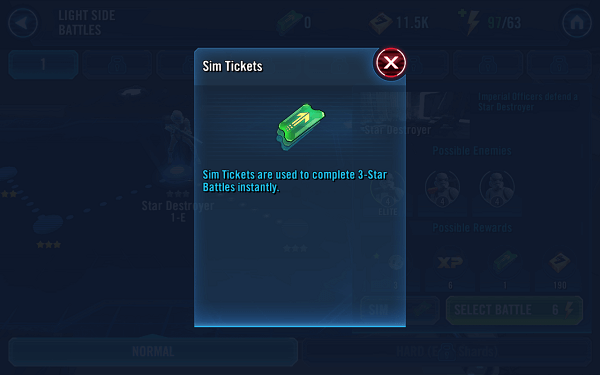 What are Sim Tickets? Sim Tickets are the easiest way to amass XP, Training Droids, Credits and other sweet rewards without going through the hassle of a full fledged battle. Once you reach level 9, you gain the ability to use these Sim Tickets. When you win a battle you’ll be awarded a score and gold stars. If you earned three gold stars, which means that nobody from your team died, you can spend a Sim Ticket. A Sim Ticket instantly replays the fight and instantly wins it as well. A new wave of rewards will come your way. Characters like Chewbacca are natural tanks. They have special abilities that will make enemies attack them and only them – these abilities are called taunts. It would be wise to build your tank character first, and prioritize any and every resource you have to beef him, or her, up. Given that a tank will most likely receive fire from every enemy during battle, it’s best you do so.